April 2016: When you use proven processes for your business, it runs more smoothly. And when you use proven processes for your IT, it runs more smoothly, too. They’re called best practices for a reason! When you approach things in ways that have been proven successful in the past, you will likely experience fewer problems. Fewer problems mean less risk. ITIL is the most widely accepted approach to IT service management in the world because it helps manage risk, which in turn helps businesses grow, innovate and prosper. Stable IT means fewer interruptions for your team. When your IT pros follow ITIL, if you do experience IT problems there are processes to follow that solve them. And there are fewer problems to begin with because the ITIL framework is a proactive approach that incorporates advance planning, transparency and accountability. It’s always helpful to spend as much time on your business as possible and as little time dealing with IT problems. 3. More cost-effective over the long term. Just as the mechanic down the street can probably fix your car for less money than a specialist who’s trained to work on your car specifically, you have to ask yourself what the lower price actually costs you. The generalist probably won’t guarantee the repair and the same problem may come up again — so you’ll have to fix it again. The trained specialist who follows a set of standards, on the other hand, will most likely fix it right the first time and feel confident guaranteeing the repair. Which means the best practices solution lasts longer and ultimately saves you money. 4. Easier to hire and transition staff. When you use a standard framework for IT management, hiring new IT employees is a lot easier — are they ITIL trained? If so, then they’ll know what to do and your interview can focus on other things. And if you happen to need to scale quickly or if one of your IT staff suddenly takes another job, you’re in a far better position. 5. Help your company grow. Ad hoc is fine for startups but mature companies need a solid plan developed by well-trained professionals. Companies following ITIL have the type of operational maturity that positions their businesses for growth and opens doors to new opportunities. The fact that other mature companies are also using ITIL gives them a common framework on which to execute and a whole set of potential collaboration problems that instantly go away. 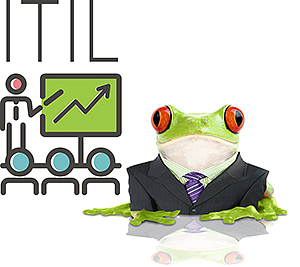 As much as smaller in-house IT staff want to provide excellent IT and also may want to use the ITIL framework, ITIL training takes time and money. So if the staff operates in “get-it-done” mode or on a shoestring budget — as many do — adding research and process improvement to their duties isn’t usually in the cards. And a lot of those IT pros on smaller staffs are very skilled, innovative and capable! So they leave for greener, ITIL-er pastures. Leapfrog is all about processes and procedures that work. And we’re all about smart, capable staff! We train our team to follow ITIL and we’re SSAE 16-compliant, too. Since IT problems are business problems, solving them according to best practices means less risk and more opportunities for your company. And happier employees.